Last edited by SOHC; 12-26-2018 at 05:00 AM..
Do you have the part # no for the front trans seal? Wait! I've replaced 2 rear main seals over past 10 years, guess which one held up and installed the best to this days? Volvo OEM the one with install sleeve. I got both seals from the local bearing shop, I couldn't find a genuine Volvo one but if I get 10 years out of it I will be happy, the car is rough. Interesting. I have a hard time giving away AW70s for free over here. I can reading comprehension very well as you can see. It was all ways not a very common car over here, back in its hay day it was all British and Austrian and American cars over here, then the square Volvo went out of fashion and was replaced with ****ty 90s japanese cars. What year did the aw 70 start ? 90s Japanese cars are awesome. As for AW70s, try looking for an A43D out of a Toyota of some flavor. They are ****ty 90s Japanese transmissions after all. Just swap the bell housing over. AW55 in an ‘81-82 car to AW-7x is usually a pretty painless swap. A43D in really anything but a Volvo donor is basically a dead end by itself, only because to drive the “Volvo” speedometer you’re going to need the tailshaft portion from the Volvo with 4 speed auto iirc (the tail housing and speedo gear all works from the aw55 to the 4-speed Aw71 up to/ including 1992), and by the time you dig one of those up that’s any good that hasn’t been rolling around on black fluid for the last 20-30+ years with a shot “extension housing” (volvoid speak tail housing) bushing, you’ve probably found the whole donor transmission worth using. You’re going to need the odd kickdown cable from the (k-jet? or is your car carbed?) for 4 speed auto ideally. You’ll need the cooling lines or bend your own I guess, dealer used to sell them new for reasonable. Shifter box and overdrive wiring sub- harness and solenoid ideally and a late denso solenoid (ideally) that isn’t a eurotrash Piece of junk from one of those world class quality control cheap 90s Japanese cars ideally (not required to get it in and working, you can use your 3 speed shifter box/lever). Linkage from shifter box to trans. Pretty straight forward swap, worth gaining a gear (assuming they even have roads where people drive for any distance above 45mph in NZ...we sort of still have those in the states...between 10am-11am, 1pm-2pm and midnight 4am in/around most major cities if there isn’t a wreck and/or emergency/dire remedial construction done at 6x the cost/3x behind schedule of Germany/Japan/some other industrial powerhouse and/or the weather stays agreeable ). You can use any aw7x from a redblock car 2/7/9 82-92. Rare as they may be I’m sure there’s something around. Or prv6 provided you swap the converter housing (easy enough), mount bracket (easy enough), & kickdown cable (not the most pleasant and difficult not to break the clips off). Converter stall speed is miserably pathetic on 89-92 Aw-70L in n/a 7/9, even with the 4.10 axle they put in those cars, they can’t get out of their own way. Avoid if possible. If you want lockup, pair with 4.10 gears as Volvo did and the somewhat less offsensively pathetic stall speed converter they used on Aw-72L 16V cars and rest-of-world late 940T with the Aw-71L. They’re getting old enough, that good as those trans are, the torque converter clutch lifespan isn’t infinite and much shortened on abused units. Non-lockup converters rarely seem to fail if ever. Only replaced a couple. Don’t tow or drag race in overdrive with the aw-7x. The Zf autobox when updated with the best of the junk drawer from the V12 bmws and late Land Rover zf-24HP is actually stronger for towing use with a much stronger converter clutch and overdrive. Those all died a horrible death in the Volvos and bmws when revved in park with some residual pressure on the c2 clutch pack. The A43D family/Japanese copy of the borg Warner 03 family (used in the 318 mopar cop cars) aren’t junk either, despite volvo’s Best efforts to install a miserable dipstick tube on them that didn’t slide apart neatly to remove the pan, only 1 magnet in the pan instead of 2 on either side of the screen in special little indents to catch the crud, tailshaft bushing that wears out since Volvo apparently lost the memo that there’s supposed to be an oil pressure supply to said grooved bushing, euro trash electronics ‘quality’ OD solenoid, janky shift linkage in place of strong cable that never wears out on the Japanese cars, mount that gets soaked with fluid, cooling lines with fittings that leak/lines rust rub through etc. Don’t forget the o-rings around the pump on the converter housing while it’s out taking a bath in the 10-quarts or atf those things have in them or whatever. Front seal I always just got from Toyota (who owns Aisin) for dirt cheap with less wait than Volvo . 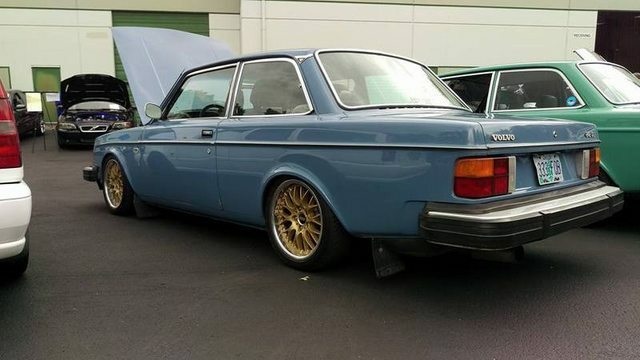 Or most anything that wears out not specific to the A+ job Volvo did adapting that trans to the Volvo engine/chassis/driveline (everything tailhousing back is all pretty much volvoid application specific). If you send me $20$14.99, I'll send you a how-to explaining how to make $20$14.99 from people on the internet. Last edited by Kjets On a Plane; 01-14-2019 at 11:08 PM..